Bingo Chios - Chips that are used to mark off a bingo card, so it is kept clean. Blackout - Also known as Coverall. To win, you must cover the entire card. Caller - Whoever calls out the bingo numbers. Chat Room - An online room for bingo users to talk to each other while they play online bingo. Dauber - A bingo dauber is what is used to mark off the numbers that are called while the game is being played. Early Bird Game - Games that start at an earlier time than when a game is normally scheduled. Free Space - The center of each bingo card has a card marked "Free space". This is the space you can always mark off on each game. Game Board - This is the board that can be found above the bingo card that shows which balls are already in play. Game Room - A term used in online bingo playing. Many online games may divide up their players into different gaming rooms. G.I.T. - These are a system of electronically enhanced daubers that players can use to play many different packs at the same time. Most of the time there is a rental fee associated with them and may only be used as one per player. 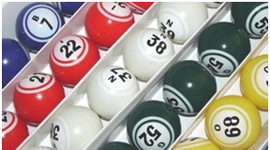 Hard-Way Bingo - In this type of bingo, players cannot use the free space to get a bingo. It must be in one line without the use of the middle space. Jackpot - The jackpot is a big prize that is usually given to a person who gets a hard pattern on their bingo card. These patterns are predetermined; for example, a blackout. Minimum Buy-In - This is the smallest amount a player may spend to become eligible to participate in winning cash prizes. Money Ball - The money ball is one number that is drawn before the games start. If as person wins a bingo on that number, the amount they win is increased, typically doubled. Pattern - This is the shape that your card has to be covered in so you can win. Usually, this shape is a straight line, either horizontal, vertical, or diagonal. Payout Percentage - The percentage that the House pays back to its players in prizes. Online, payouts are typically around 70%. Progressive Jackpot - These jackpots grow in size until they are won. Most games require a separate buy-in to play these. Rainbow Pack - A paper pack allows a player to play on three or four different denominations of cash and prizes at the same time. Sign-Up Bonus - This is a bonus given by most online bingo websites. They use this to encourage more people to play. This is typically about 100% of your first deposit, meaning if you deposit $50, then you will be given $50 in extra credits. Six-pack, nine-pack - On one card, this is six or nine numbers that appear in a block. Top of the Hour Jackpot - Special games that are played on every hour. They may have a higher jackpot prize. Validation - This is who is eligible to win the extra jackpot amounts. Wild Number - A wild number is typically played on a bingo that starts as a double, but then leads to a triple. When the first number is pulled from the hopper, such as 42, this determines the wild number. All numbers that then end in 2 will be marked off on the bingo card.